For many the name Dion DiMucci doesn't mean much unless you're of the generation where Doo-Wop was the hip musical style of the day. Dion and the Belmonts had hits with I Wonder Why, Teenager In Love and Where or When but soon after split to go solo. As a solo artist he had major hits with The Wanderer, Ruby Baby and Runaround Sue. 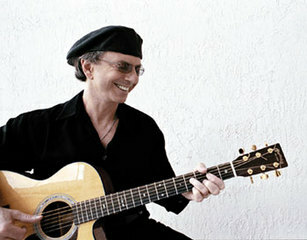 Though normally backed by a band, Dion toured for many years with just his guitar after coming off years of heroin abuse as a Christian singer. In 1968 he was given the song Abraham, Martin & John to record accompanied by his guitar, a harp and backing vocals which took the song over the top and earned him a gold record and re-started his music career. Dion was inducted into the Rock & Roll Hall of Fame in 1989 and continues to write, perform and record. His last couple of cd's have been blues based with his latest being Tank Full of Blues. Please do me a favor and mute the extra curricular crap going on in this song and listen to his finger picking. The video isn't the best but Dion's talent shines through. An interesting story about Dion; He was on tour with Buddy Holly, Richie Valens & the Big Bopper on that fateful day. Buddy had offered Dion a seat on the plane and when Dion asked how much was told $39.00. Not being able to justify paying the price that his parents paid in rent for their apartment, he declined the offer.